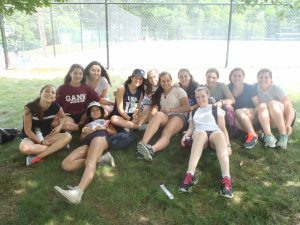 While it has only been 5 days since camp has started, Ma’alot’s summer has already been fantastic! 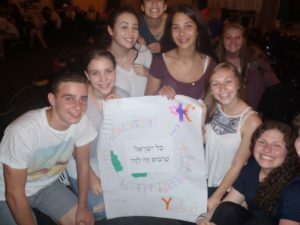 On Thursday night, the חניכים (campers) had a פעולה (activity) about the theme of the summer ״כל ישראל ערבים זה בזה״ which means “All Jews are responsible for each other.” In this activity, we discussed the responsibilities that Jews have for taking care of one another, as well as the opinion of each חניך as to what it means to be responsible for other people. After that, Friday was a day of preparation for the first שבת (Shabbat) of the summer! After a meal full of amazing שבת food—such as matzah ball soup, chumus, and potatoes—the חניכים got to participate in their first official tisch of the summer, singing beautiful שבת tunes together and telling personal and meaningful stories about life experiences they have had. After an amazing שבת full of resting and hanging out with friends, the חניכים made the best of the rainy Sunday by watching the first episode in an Israeli TV show titled מרחק נגיע (Mirchak Negiyah) and then participating in an old fashioned karaoke sing-off! 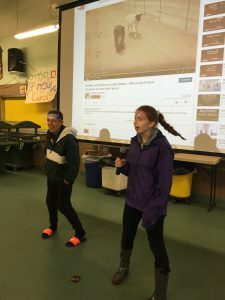 Singing songs from Mulan, the Backstreet Boys, One Direction, and others, the campers made the best of the situation and loved every minute of it. We ended the rainy day with a performance from Gary the Clown and a discussion all about the meaning of life and adulthood. The summer is truly under way and it couldn’t be going better!